This interesting surname, found recorded variously in England and France, is of Norman origin, and is from the personal name "Golhard", composed of the Germanic elements "god", good, or "god, got", god, and "hard", hardy, brave, strong. The name was introduced into Britain by the Normans after the Invasion of 1066, and it was popular in Europe during the Middle Ages as a result of the fame of St. Goddard, an 11th entury bishop of Hildesheim, who founded a hospice on the pass from Switzerland to Italy that bears his name. 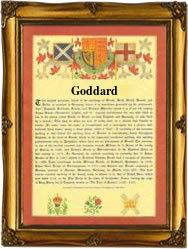 The name is recorded as a surname in variant forms throughout Europe; such as Godard and Godart in England; Goudard and Godar in France; Gotthard, Godehard and Goddert in Germany; and Goedhard and Goedhart in Holland. The personal name was first recorded in Lincolnshire in circa 1160 - 1166, with one Godardus de Clakesbi, and early recordings of the surname include; Wlfrich Godard in Norfolk, 1221; and Symon Godhard in Cambridgeshire, 1221. An interesting namebearer, recorded in the "Dictionary of National Biography", is John Goddard (flourished 1645 - 1571), an engraver, whose work, the "Seven Deadly Sins" is displayed in the British Museum. A Coat of Arms granted to the family is azure on a fess between three hawks' heads erased gold, five lozenges conjoined in fess green. The first recorded spelling of the family name is shown to be that of Robert God(d)ard, which was dated 1208, in the "Curia Rolls of Hampshire", during the reign of King John, known as "Lackland", 1199 - 1216. Surnames became necessary when governments introduced personal taxation. In England this was known as Poll Tax. Throughout the centuries, surnames in every country have continued to "develop" often leading to astonishing variants of the original spelling.